The reason that I go after these guys is that they are not on our side. They are not on the Left’s side either, because they are on their own side. Their side is their respective edgy careers which they cultivate at our own expense. They are worse than the Left because at least the Left have the dim courage to pick a side. The edgytarians throw the Right under a bus at the very first sign that their online careers are at risk of being pulled. These guys are really struggling to remain relevant and it’s not going well for them. Also struggling to remain relevant are many players in the media which are collectively going down like a fluffer with a knee injury. This morning, I noted the “Get Woke, Go Broke” factor in the failure of Mic-dot-com — which burned through $60 million in startup capital and was sold for $5 million — and a similar observation may be made about the woes of the Weekly Standard. What I’m observing is that the fence sitters, grifters, and parasites in the media are starting to have severe problems. And that’s because the battle lines are becoming sharper. Conservatism and liberalism are both dead, only many of their adherents don’t know it yet. What’s left are the two extremes as there is no place for a soft and safe middle any more. It’s going to get ugly. Friday hawt chicks & links – The no leaders edition. Being in the middle gives you the opportunity to get run over from both directions. a mug’s game is still a mug’s game. If his grasp of correlation vs causation is that bad he really is a lost cause. I read / listen to both Adam and Stefan. I’ve told libertardians that race, IQ, and culture matter. There is reason why Africa is Africa and south of the border here in the US is what it is as well. And they want to import more of that crap to a first world country. But hey, I’m a ‘da rasis’ to point that out. Leftism infects everything. Empire of Dust on YouTube. All you need to know. Chinese having to deal with vibrancy. Yeah, great doco that one. I linked to it a while ago. Heh, I guess Stefan does not want to risk losing the non-white component of his regular audience… kinda like the Australian media’s ongoing attempts to play the disassociation game between the word “Africans” and the sentence “rampaging youths in St Kilda, Melbourne”. Uttered words will never trump real world observations, the latter having evolved through many generations of timeless experience. A race ‘has’ an IQ but that IQ is an average. Within that population there is a spread – from dumb to smart. The average IQ cannot be used to predict the IQ of any one person within that population. These are basics. 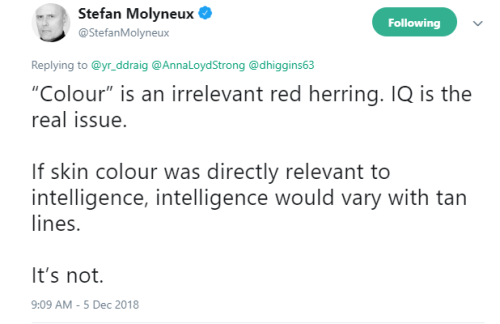 Don’t assert that anyone of _that_ colour must have _that_ IQ. Yes, _generally_ black fellas are dumber that whites or asians but you can’t say of any _particular_ afro-man that his IQ is lower than anyone elses. You may like to but then you are racist. While stating that the avg african IQ is lower than the avg euro IQ a statement of fact – that will probably still have you called racist but incorrectly. I prefer the ad hom racially aware.